My 13 Cents: Cheap (but quality) AAA and AA batteries! Cheap (but quality) AAA and AA batteries! 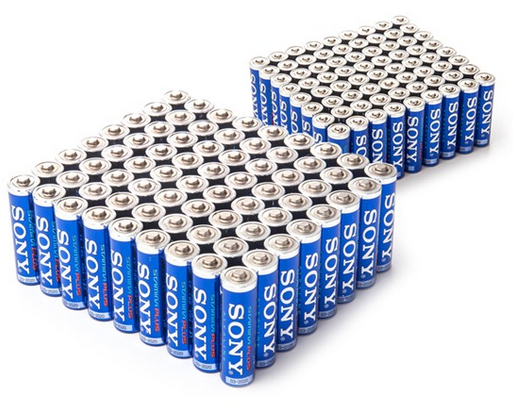 You can get 72 AAA or 72 AA Sony Stamina Plus batteries for only $15.99 right now on Groupon.com. I usually don't post too many groupon.com deals, but this is actually a really good deal that EVERYONE could use. The total price after shipping and tax is $20.98 (you can avoid paying shipping by adding sets of batteries to your cart), still very worth it...So basically these batteries are 1/2 the cost you will find else where. So if you need to stock up on some batteries, now is a great time. Plan for the future!...these batteries will last through 2024! Will come in handy for your games, toys, and especially flash lights when the world comes to an end! What good deals have you found on groupon.com lately? Would you like if I posted more groupon.com deals?....most deals are not for everyone, but every one in a while deals like this pop up that would be useful for everyone.